Ranging from the popular forts of ancient Rajas and Maharajas to extraordinarily sculpted temples and caves, the best monuments in India takes you to the journey of the bygone era. 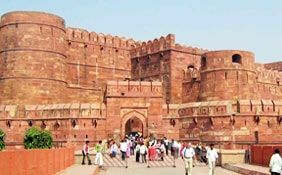 As you move from the northern part of India, you can visit the Taj Mahal, Agra Fort, Lotus Temple, Qutub Minar, Red Fort, Fatehpur Sikri, and India Gate. Taj Mahal is one of the Seven Wonders of the World. It is a must visit for all the tourists traveling to India.While the Agra fort has been counted as the World Heritage Site by UNESCO, Qutub Minar is the highest brick tower in the whole wide world. 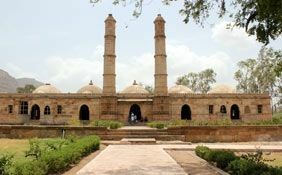 There are a wide range of famous Indian monuments to see during your Rajasthan tour. The Amer Fort, Chittorgarh Fort, Dilwara Temple, Hawa Mahal, Jahaz Mahal, Jai Mahal Palace, Jantar Mantar, Lake Palace and Umaid Bhavan Palace are the popular ones. 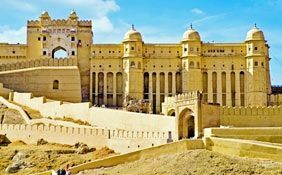 The Amer fort, an example of the Rajput and Muslim schools of art, was made by three rulers and took around 2 centuries to complete. The Hawa Mahal in Jaipur is a good example of the Rajputana architecture. The forts and palaces at Udaipur are brilliant works of art. The Umaid Bhavan Palace is a blend of eastern and western architectural styles. Tourists who skip a tour around these popular monuments in India would miss out an integral part of their India tour experience. If north India boasts so many magnificent pieces of art, South India offers the tourists an incredible range of artistic splendor. 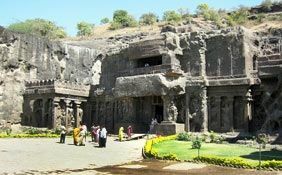 The sculptures displayed at some of the south Indian monuments like Ajanta & Ellora Caves, Thousand Pillar Temple, Tirupati Temple, Somnath Temple, Sanchi Stupa, Shri Meenakshi-Sundreshwara Temple Madurai, Nataraja Temple, Kanchipuram Temples, Khajuraho Group of Monuments, Mahabalipuram Monuments, Golden Temple, Hampi Monuments, Gol Gumbad, Elephanta Caves, Charminar, Chola Temples and Sun Temple are amazing. 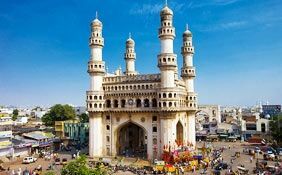 Tour around the whole Hyderabad city.